Expert crackshot Maddie Campbell will do whatever it takes to survive in this female Robin Hood of the old west story -- including evading bounty-hunter-for-hire Scott McSween who's intent on bringing her in. Not your ordinary thief, widow and mother Maddie Campbell likes to think her wealthy victims are merely "donating" to herself and the hundreds of other widows and children left abandoned by the mining company after a devastating accident took the lives of their menfolk. 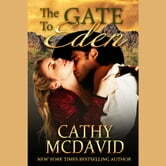 Maddie's secret excursions are quite successful...until ruggedly handsome former lawman Scott McSween arrives in Eden to investigate the recent string of crimes. Despite her efforts to throw him off track, they can't resist each other. He knows she's somehow involved and is determined to draw out all her secrets in the most exquisite ways--with soft caresses and passionate kisses. But when finally confronted with the truth, that Maddie is actually the thief he's been hired to hunt down and bring in, will Scott choose the woman he loves or his duty to the law?